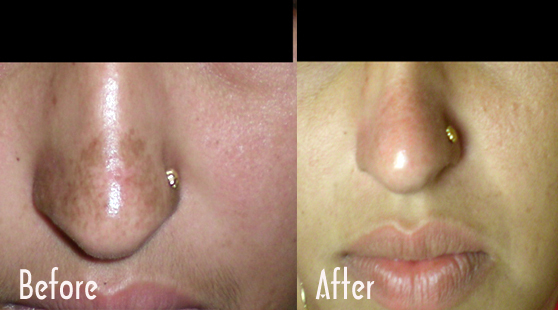 Mostly medical treatment gives limited results, since the depth of pigment is more in such cases. Pigmentation of face /Melasma (Blemishes) :- Blemishes are commonly seen in females as brown patches on the cheeks, nose, forehead and upper lip. Precise cause is not known, but mostly seen in people having a family history, hormone changes (related to pregnancy), females on birth control pills and long term sun exposure. • Based on skin type medical treatment along with home care regimens are advised. • Chemical peels :- Glycolic acid, Yellow peel (Korean), Refinity Veda peel, Ferulic peels etc are advised. 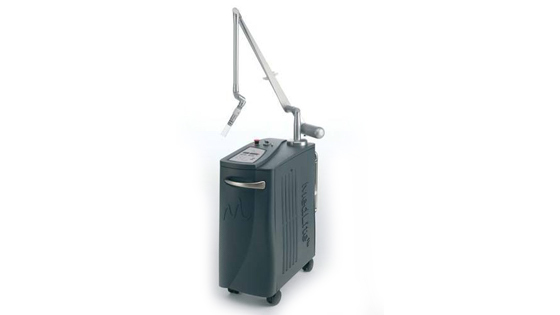 • Q-Swt ND YAG Laser and IPL (Photo rejuvenation/Glow facial/laser facial) :- A non-surgical method in which "Nanolight" is used to burst the pigment melanin. On an average 4-6 sittings are given at an interval of 1 month. The procedure is combined with herbal facial. This combination treatment improves more than 70% patients leaving spotless, smooth, shiny-skin. Meso-Therapy (Electroporation) :- Specific chemicals containing growth factors, Vit C & other brightening agents are injected into the upper layer of skin by machine (Electroporation). All these procedures are combined with facial treatment to enhance their efficacy. The drugs, used are CE marked & safe according to international standards .